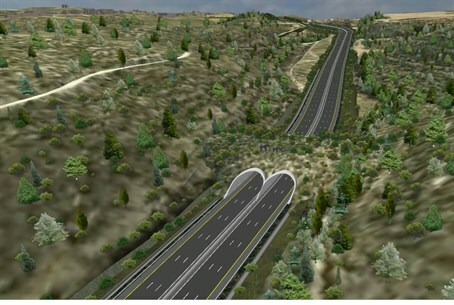 Work has started on a new “eco-bridge” that will allow wildlife to continue to flourish even as tens of thousands of vehicles travel daily on Road 1, between Jerusalem and Tel Aviv. The bridge is being built over a new roadway that will improve travel time between the two cities, cutting distance and time spent on the road for drivers. The 70 meter wide bridge is being built over a section of the new roadway, between Sha'ar Hagay and the Shoresh Junction. Currently, the section of the road in this area is very narrow and twisting, and has been the scene of many accidents. The new section of the road, being built in the hills north of the current road, will be wider and allow drivers to drive at highway speeds, since it will be less curvy. For decades, the area where the road is being built has been forested, and an ecology has developed there which includes animals such as deer, mountain goats, boars, and others. In order not to ruin the ecology of the road, it was decided to construct an “eco-bridge” for animals over the new section of the highway. The eco-bridge will be a green area indistinguishable from the surrounding forest, enabling animals to easily pass between both sides of the highway. Speaking Sunday, Transport Minister Yisrael Katz said that the new NIS 2.5 billion road was a national project that would enhance productivity and enable workers to get to and from their jobs much more quickly and efficiently. “The new 16 kilometer section of road we are developing will solve the commuting and transport needs of Israelis for decades to come,” Katz said.